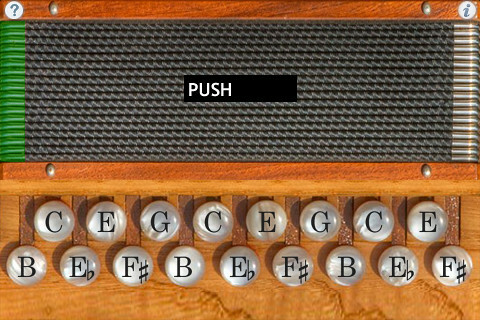 BeeSeeBox is an authentic sounding, easy to play, Irish B/C Button Accordion for the iPhone/iPod Touch. 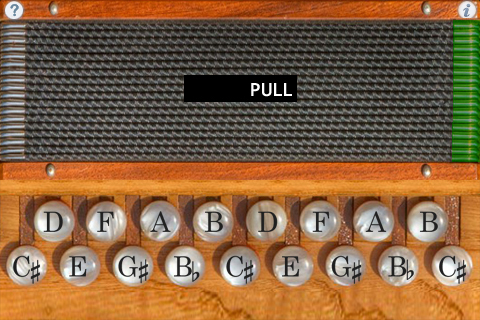 B/C is a very popular accordion tuning for playing traditional Irish music, with the bottom row in the key of B, and the top row in the key of C.
The app uses the same fingerings as the real instrument. 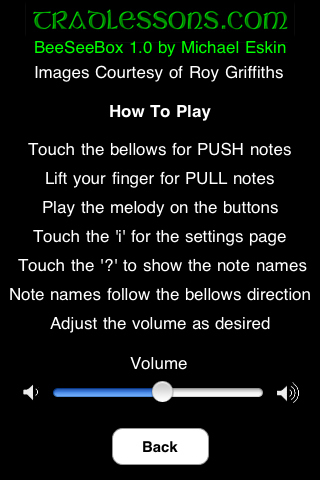 The built-in note guide will help you learn your way around the buttons. Touch the anywhere in bellows area at the top of the screen for PUSH notes, lift your finger for PULL notes. The PUSH/PULL indicator shows the current bellows direction, also the sides of the bellows light up tracking the bellows motion. Touch the buttons with the fingers of your right hand to play. Buttons light up in green when touched. Touch the ‘?’ icon to show note names. The note names change with the bellows direction. Adjust the Volume slider as desired. 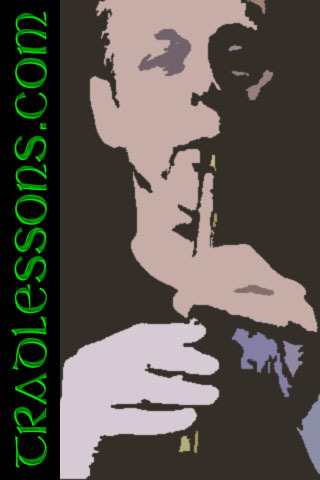 On the settings page, touch the Tradlessons logo to visit the support website. Touch Roy Griffiths' name on the settings page to see more of his high-dynamic range melodeon photos on the web at http://melodeonmacro.roygriffiths.com. Thank you to Roy for graciously providing the use of his images for the app. Uses extremely high-quality per-button audio samples recorded from a high-end button accordion. Demonstration video - "Merrily Kissed the Quaker's Wife"
To visit the support web site, touch the Tradlessons logo. Touch Roy Griffiths' name to see more amazing HDR melodeon images on the web. Q: Are the fingerings the same as real button accordions? A: Yes, exactly the same. To be playable on the iPhone/iPod Touch screen, I've removed the two lowest notes from the bottom end of the scale on each row. The resulting range is perfect for playing the majority of traditional Irish tunes. 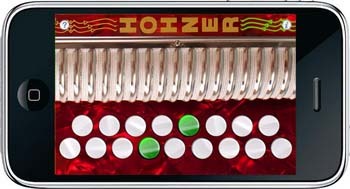 Q: Now that I've learned the fingerings for some tunes on the iPhone/iPod Touch app, I'd like to buy a real button accordion. Who do you recommend? A: The Button Box carries a wide range of new and vintage instruments. Q: The buttons are absolutely gorgeous, where did you find the image? A: Photographer Roy Griffiths took some amazing HDR (high dynamic range) photos of his own melodeons. He has very generously and graciously allowed me to use portions of the images for the apps. I am very interested in any suggestions for features or improvements to the apps for future updates, please drop me an email anytime with your ideas! Apple, iPhone, iPod Touch and the Apple logo are registered trademarks of Apple Inc. in the USA and other countries.